Tomorrow is Fat Tuesday and for many that means filling up on some serious fat before the Lenten season begins. For others it signals a time to celebrate and eat as much gumbo and paczkis as possible. Here are some of Chicago’s best places for gumbo and paczki. Big Jones serves gumbo ya-ya, “It all begins with the roux, made in the traditional Cajun style, with our andouille sausage, chicken, pork, and aromatic Arkansas rice.” See the gumbo in my Tastemade video. Shaw’s Crab House has seafood gumbo full of fish, okra and fresh vegetables. Fat Willy’s Rib Shack’s comes with a side of corn bread or Texas toast to go with the chicken and andouille sausage gumbo. Delightful Pastries is the go-to Polish bakery in Chicago. They have a variety of fillings and even some gourmet styles with alcohol so you can hit the fat, sugar and booze trifecta! Weber’s Bakery Inc. is open 4am – 6pm on Fat Tuesday (regularly 4:30am open) and will have not only fresh paczki but King cake. Swedish Bakery specializes in European sweets and will be offering paczki for this time of year in a few different flavors. 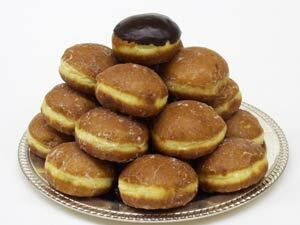 Dinkel’s Bakery have been around since 1922 and is a favorite in the neighborhood for paczki.